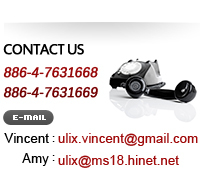 ULIX established in 1991 is a professional manufacturer of bike accessary like kickstand, carrier, display rack and bottle cage. Due to special design and good quality, our products have received warm welcome in the Europe and America markets for over ten years. Moreover, ULIX is proceeding toward diversity operation, and also involve the OEM development for the related productions such as medical and sport equipment. ULIX can provide diversified technique services to make customer's new design and idea happen, on the one hand ULIX can accumulate experience and increase technique, on the other hand our products can lead customers to get rich harvest and both of us can reach win-win situation after cooperating ! are the basic beliefs of ULIX. We believe these key factors are not only the only way to establish long relation with customers, but also to make ULIX a century-old enterprise. Copyright © 2013 U-LIX INDUSTRIAL CO., LTD. All Rights Reserved.